Why, one might ask, is Pieter Breughel's "The Triumph of Death" pictured on the cover of this release, given its title? The Viennese, in the years surrounding 1700, had plenty of reasons to think of death. First, the Austrian city was decimated by the plague, once in 1679 and again in 1713. Also, the Turks threatened the city in 1683, and it was many years before they were finally repulsed. God was a refuge for many during those difficult decades, and so it is not surprising that composers of that time turned their thoughts both heavenward and to the disease and destruction below. 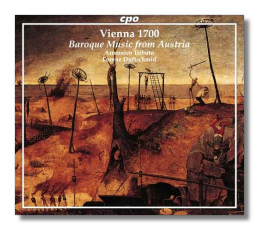 The first CD opens with a tune everyone knows – O du lieber Augustin – but how many know that it is a song about Vienna laid low by the plague? Similarly reminiscent of bagpiping is Schmelzer's string sonata Polnische Sackpfeifen – here reconstructed by maestro Duftschmid. Gegrüßt seist Du, also by Schmelzer, is a lovely soprano aria in praise of the Virgin Mary with extensive instrumental ritornellos. If it is battle music you want, Duftschmid offers up not only Biber's famous example – complete with the cacophony of one tune being piled up on another in the movement called "Die liederliche Gesellschaft von allerley Humor" – but also one by Kerll. Another amusing example of Biber's flair for pictorial music is his Pauernkirchfahrt, a depiction of peasants making a religious pilgrimage, and ending the day in rustic dancing. The heart of these two CDs, however, is found in the short sacred works of Johann Joseph Fux (1660-1741), who served as court composer for Emperor Leopold I from 1698 until Fux's death. These are magnificent works. It is thought that perhaps Fux studied in Italy, and one detects a possible Venetian influence in these works – particularly in the grand Litaniae Sancta Maria – in the brass writing, and in the alternation between solo and tutti passages. Köchel, who catalogued Mozart's works, also thought enough of Fux's music to do the same for them. In Fux's sacred music, we truly hear the apex of the Austrian Baroque. On these discs, Fux music is complemented by corresponding Gregorian chants, much as it might have been at the time of its original presentation. Lorenz Duftschmid began his musical career as a gamba player, studying at the Schola Cantorum Basiliensis (which cpo's English translator amusingly turns into the "Schola Cantorum Brasiliensis"!) When only 25, he was appointed to the Graz College of Music, and was named music director of two festivals devoted to early music. He founded the original instruments ensemble Armonico Tributo (named after a work by Georg Muffat) in 1989. Duftschmid, with or without Armonico Tributo, already has several recordings to his credit. This new one deserves the broadest possible exposure. Duftschmid's approach to this music is historically authentic, polished, and emotionally warm. The sacred music, in particular, is performed with lively devotion and tenderness. Outstanding support is given by the five vocalists and the two choirs. There's nothing of the museum about these readings – just an atmospheric recreation of a milieu in which fear and hope lived side by side, and in which music reflected the experiences of commoners and royalty alike. The engineering is excellent, and cpo's thick booklet contains extensive background material, texts, and translations.